The holiday season has arrived! Put on your jolly hat and let’s celebrate the most wonderful time of year, a phrase that literally has its own hashtag. A time filled with sweet delights, festive parties and decorative Christmas trees. Yes, I used the politically incorrect term “Christmas.” You can choose to take offense to that or not. I won’t mind. I’m not Starbucks. However, in the midst of the holiday bustle, it can be stressful pulling together a unique look as you stuff your face and overindulge on vino and eggnog. Have no fear, your fashion inspiration is here! With the help of Rocksbox and my fabulous friend Rebecca, I’ve crafted a holiday look you can easily wear for your next fête. My number one advice is to make sure you have a quality winter coat. I’m not talking about the one you would wear to the slopes or shovel snow. It’s essential that both women and men have a classic yet sophisticated wool coat in their fleet of winter outerwear. There is a time and place for that North Face jacket and arriving at a holiday party dressed in one isn’t one of those times. My second suggestion on pulling together a classic holiday look is to make the sweater dress your winter bestie. A sweater dress is perfect for this time of year because it gives you a lot of flexibility when it comes to layering to stay warm. Depending on your skin tone, go for a hue that creates contrast. This chocolate sweater dress complements Rebecca’s complexion nicely, paired with black tights and a sandy colored wool coat. Accessories are what give this outfit personality. The wide tan colored belt and shoes synch together in a minimalist design, leaving more room for creativity with jewelry. 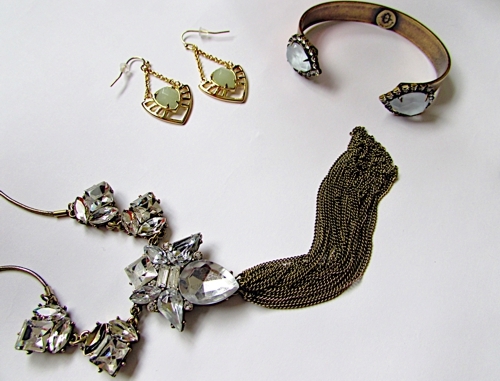 In this instance, the jewelry was already styled for me by a Rocksbox stylist. I know! It’s weird. A stylist styling another stylist virtually. Regardless, the jewelry goes well with the holiday season particularly the long tassel necklace, dangle earrings, and open cuff bracelet. I loved the bracelet in ice blue so much I decided to keep it but sent the rest back. Unfortunately, I received the tassel necklace with a stone missing but Rocksbox was generous enough to give me $10 to spend on my next purchase to make up for the defect. As I mentioned in my previous post, I received a three month subscription of Rocksbox in exchange for a review as part of the brand’s blogger outreach campaign. 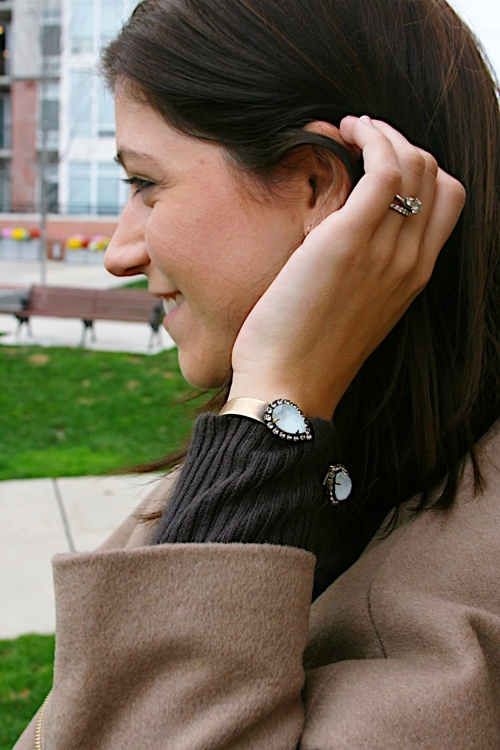 Rocksbox is an online jewelry rental service where a stylist hand picks jewelry based on your style. Are you ready to give Rocksbox a shot? Sign up for one free month with special code stylebyvalxoxo. If you choose to continue your subscription after the free trial, it’s $19 per month to borrow a set of three pieces, which you can switch out whenever you like. Is there a certain piece that gives you that “need to have it” feeling? Go ahead! You can buy any piece from your box. Also, each month you receive $10 to apply towards a purchase and free, prepaid shipping both ways. *Disclosure Statement: I was not financially compensated for this post. However, I received a three month subscription from Rocksbox for review purposes. The opinions expressed in this post are completely my own based on my experience. This entry was posted in Style Talk and tagged holiday fashion, jewelry style, personal styling, Rocksbox, style session, winter style. Bookmark the permalink. I like the tassel necklace and the open cuff bracelet. Thanks! It’s one of my favorites. Plus, it’s perfect for the holidays. The bracelet easily goes with everything.